With Real Madrid expected to consign Julen Lopetegui to his local Oficina Empleo this morning, Antonio Conte has been installed as the favourite to replace him as long as he can extricate himself from the contractual ties that bind him to Chelsea. Reports from Italy suggest the Italian and his former employers have agreed on a compromise over the £9.5m pay-off he received upon leaving the club last summer, which Conte would be obliged to forego if he takes another job this season. Following Real’s thrashing at the hands of Barcelona on Sunday, Lopetegui’s dismissal after 14 games in charge is a formality and Conte is eager to replace him. Liverpool’s well documented pursuit of Piotr Zieliński could be about to hit the buffers. Reports from Italy suggest Napoli’s Polish midfielder is on the verge of inking a new deal with the club that will significantly increase the £60m release clause the Merseyside club were hoping to trigger in January. Manchester United are giving lank-haired Atlético Madrid left-back Filipe Luís the glad eye and could move for him in the new year. Having come on as a half-time substitute in his side’s 2-0 win over Real Sociedad at the Wanda Metropolitano on Saturday, the 33-year-old Brazilian promptly rifled a smashing effort into the top corner to get himself on the scoresheet. Lyon midfielder Tanguy Ndombele is a 21-year-old in big demand, with Juventus, Manchester United, Manchester City and Chelsea all believed to be interested in securing his services. City got to see exactly how effective he can be in their defeat at the hands of the French side in their opening Champions League match this season, while United and Chelsea are reported to have had him scouted at Hoffenheim last Tuesday, when he got among the goals in Lyon’s 3-3 draw with the Bundesliga side. Like Benjamin Mendy, Ndombele hails from the Parisienne suburb of Longjumeau and is renowned for his dribbling, ability to beat a man and pick out a pass. Tottenham were strongly linked with him last summer before he made his loan move to Lyon from Amiens permanent. On £70,000 per week at Tottenham Hotspur when he could almost certainly be earning at least double elsewhere, Christian Eriksen is ready to re-open contract talks with his chairman Daniel Levy and ask for a hefty pay rise that would make his salary commensurate with what a man of his sublime talents surely deserves. The mild-mannered 26-year-old is contracted to the club until June 2020 and last signed an extension just over two years ago. Meanwhile in Italy, Juventus vice-president Pavel Nedved has appeared on Sky Italia to pour a big bucket of cold water over speculation that Juventus are planning a January raid on Old Trafford for their former midfielder Paul Pogba. The midfielder’s teammate Juan Mata, meanwhile, could sign for Arsenal if he leaves United on a free transfer when his contract expires next summer. When Sergio Aguero scored five in 20 minutes for Manchester City against Newcastle three years ago, the accolades flowed as fast as the goals, though not in Brian Dear's house. There, the attitude was, well, who's not done that? What Defoe knew was that back in 1965, 50 years before Aguero, Dear had also rattled in five goals in 20 minutes in a top-flight match. Defoe had taken all of 36 minutes for his five against Wigan, so he knew of Dear's achievement. Those were the days. Those were the days when a striker could earn less than £1 a goal. Not that Dear was complaining. 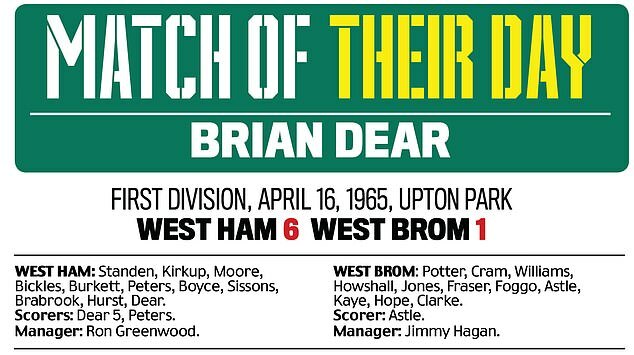 Part of a remarkable feat against West Bromwich Albion was that this was Dear's 16th match for West Ham. He was a 21-year-old happy to get a place in an accomplished team. 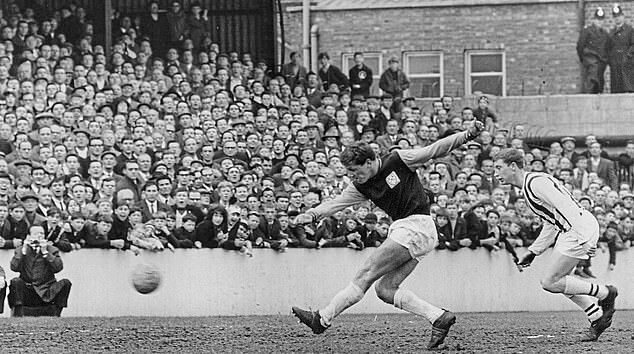 Having made his Hammers debut as a teenager three years earlier, Dear was mainly in the reserves at a time when there were no substitutes — a rule changed for season 1965-66. When Johnny 'Budgie' Byrne was injured playing for England, Dear was given his chance by Ron Greenwood. In 15 matches from March to May 1965, Dear scored 14 times and won the European Cup-Winners' Cup in front of 98,000 at Wembley. He had a goal disallowed in the final. It turned out to be the spring and summer of his West Ham career, and in its midst was this five-goal glut on Good Friday morning. Dear was born in Plaistow in 1943 — 'a war baby' — and grew up in Hatherley Gardens 300 yards from Upton Park. There, he watched the likes of Billy Dare and Noel Cantwell. Dear played for England schoolboys and was signed by his local club under manager Ted Fenton. West Ham had won the FA Cup in 1964, beating Preston in the final, and entered the Cup Winners' Cup. Ghent and Sparta Prague were beaten and West Ham faced Lausanne in the last eight. Dear scored the first in a 2-1 away win and then got two more in the home leg. In the semi-final against Real Zaragoza, Dear again scored the first, this time at Upton Park, while also getting goals against Aston Villa and Leeds in the First Division. Dear made it 2-0 on 44 minutes — 'It was close in, a cross from the right,' he recalls — but Jeff Astle pulled one back for West Brom a few seconds later. It was 2-1 at half-time. Then Dear scored four in 18 minutes. By the 64th minute it was 6-1 and Dear had five. He kept the ball, was photographed with it and years later sold it to the West Ham chairman Terence Brown. Dear was to stay at Upton Park until 1969. He had brief spells at Fulham and Millwall before returning to West Ham in 1970. He then ran pubs, as ex-pros did, joined the catering trade and when Bobby Moore became Southend United manager in 1984, Dear joined his old Hammers colleague at Roots Hall. Today Dear is a Southend club ambassador. He broke English records for scoring speed that day against West Brom, and it was the biggest individual Hammers haul since the legendary Vic Watson hit six in 1929 against Leeds. Matches trialling VAR in Carabao Cup fourth round? I was there too. I remember that game like it was yesterday. Sadly I can’t remember what happened yesterday!